You’ve likely heard of most dental restoration options. Dental crowns, bridges, dentures, and even dental implants are fairly well known. However, two conservative solutions that many patients have never heard of are inlays and onlays. These restorative dentistry solutions allow us to maximize existing dental structures and keep smiles whole and healthy. Inlays and onlays offer patients a middle ground between fillings to repair very small areas and dental crowns to repair the whole tooth. Inlays are an advanced restoration used to repair dental damage between the cusps of the tooth. A cusp is the raised part of the tooth on the biting surface. When dental decay or damage is too deep to be repaired with a filling, an inlay can be crafted from stronger materials and placed inside the cusps of the tooth. Onlays offer conservative restoration to replace one or more damaged or decayed tooth cusps. Rather than removing healthy tooth structure to accommodate a crown that fits completely over the top of the tooth, the onlay simply repairs the parts of the tooth that are damaged. This can be one or more tooth cusps and/or the sides of a tooth. What Happens if Inlays & Onlays Aren’t an Option? For some patients, an inlay or onlay just won’t effectively repair the tooth. If we believe the best choice for the patient’s overall oral health is to place a dental crown over the entire tooth, we will do so. Another possible restorative option we may recommend is a root canal. 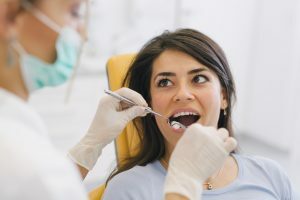 If the decay or damage has accessed the inner layer of the tooth, root canals will be necessary to prevent unnecessary discomfort or dental sensitivity. Following root canal treatment, patients will need to have a dental crown placed to protect and strengthen the repaired tooth. At the Monroe dental office of L. King Scott, DDS, we are dedicated to helping our patients keep their smiles whole and healthy. We focus all of our treatment plans on preventive dental care including regular appointments in our office. When dental health concerns do occur, we emphasize conservative treatments. By using the procedure that preserves the greatest amount of healthy tooth structure, our team partners with patients to maintain their whole, healthy smile for life. Call our Monroe dental office to find out more schedule an appointment with our team.